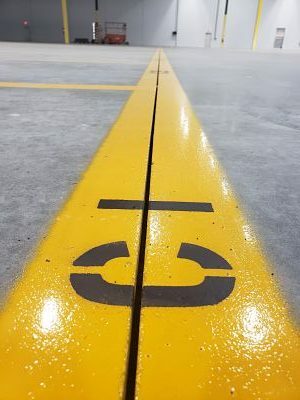 There are some important differences between striping outdoors on an unsealed concrete or asphalt surface lot versus that very same application inside a warehouse; the preparation and product choice can differentiate between a future of chipping lines and constant paint reapplication to one of smooth striping and decreasing maintenance budgets. Hotline Freight recently decided to construct a new warehouse facility outside of the DFW airport as a launching point for their LTL transportation and delivery business. As part of the new construction, they were looking for a partner to layout, prepare, and apply the new safety and organizational lines throughout their open pattern warehouse. At this juncture, they partnered with CI Pavement to make the delivery. 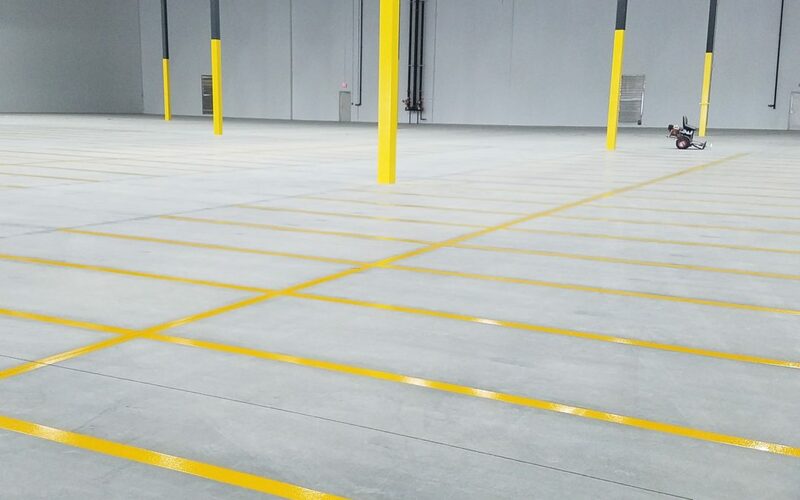 Sealed concrete is built to reject unwanted coatings such as oil, paint, and other undesirable liquids that may find themselves on the floor of a warehouse. It is, therefore, imperative to strip the concrete of that seal in order to implement a new coating. 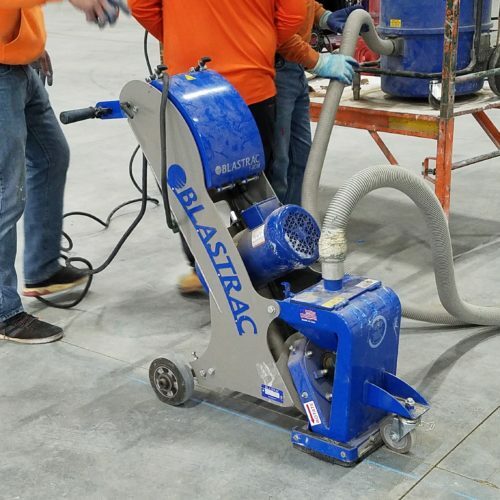 Bead blasting, the process of rapidly accelerating sharp metallic “beads” at the pavement, is usually the best way to accomplish this. The blast substance is reclaimed via magnetism, and the dust can be vacuumed, minimizing concrete dust and air particulates. Once this process has been completed, the choice of application material is the second imperative decision. A heavy duty two-part epoxy is usually the material of choice. Once it hardens, or cures, it will stand up to the demanding industrial requirements and finish with a tough, high gloss finish with excellent resistance to alkalis, abrasion, corrosion and chemical attacks. It will also endure admirably through forklift traffic and other unique abuses. The warehouse is now open for delivery! Take a moment to watch our video above on the process, and Contact us today for all of your indoor, bead blasting, and warehouse striping needs in the Fort Worth Dallas area!